Celosia Orange is a great color for this time of year. One of the best things about spring is the opportunity to embrace the brightness of the season. Celosia Orange is a great color for this time of year. It’s a crisp, saturated, uplifting hue that can add a bit of fun to a space or provide a boost with a dramatic splash of color. Use it to spice up a neutral palette or add zest to a modern interior. 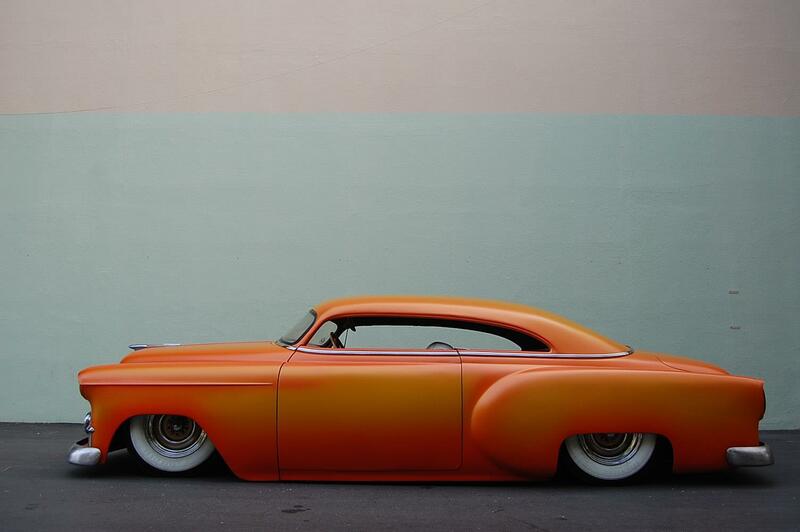 Bold and eye-catching, Celosia Orange is one of my favorite shades. 2. Hermes, always a classic. Blueberry and yellow is one color combination I really love. A few days ago, I saw some freelance work my Project Manager Jess was working on. She makes beautiful cards, and was testing colors for her creations. One of her palettes used blueberry and yellow, and it struck me as so appealing. The next day, Krystal, another project manager, came in dressed in a really great outfit with the same blueberry and yellow palette. I love how inspiration can come in tiny ways like this; a lovely card or a striking outfit. Inspiration doesn’t have to come from some grand scheme but can be found in so many places. These colors became the inspiration for an entire family room design. The contrasting shades of blueberry and yellow bring out the best in each other and provide such a bright, rich hue. It’s a graphic and eye-catching combination, with the darker blue bringing out the sunniness of the yellow. It brings to mind warm summer days, something most of us are looking forward to this time of year. 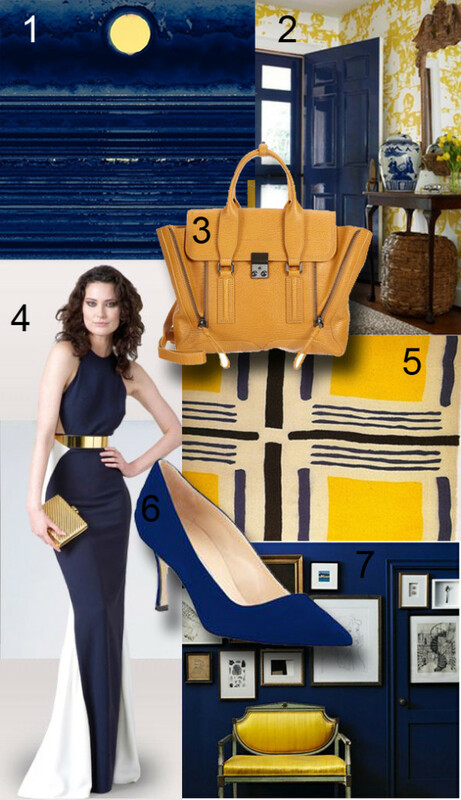 In both interior design and fashion, blueberry and yellow are so uplifting. Navy and gray make a great combination and are so satisfying during short, chilly days! This time of year, with cold weather setting in, I begin to gravitate toward heavier, textural fabrics and colors. I think of handsome, masculine hues and the pleasure of wrapping yourself in cashmere and wool. 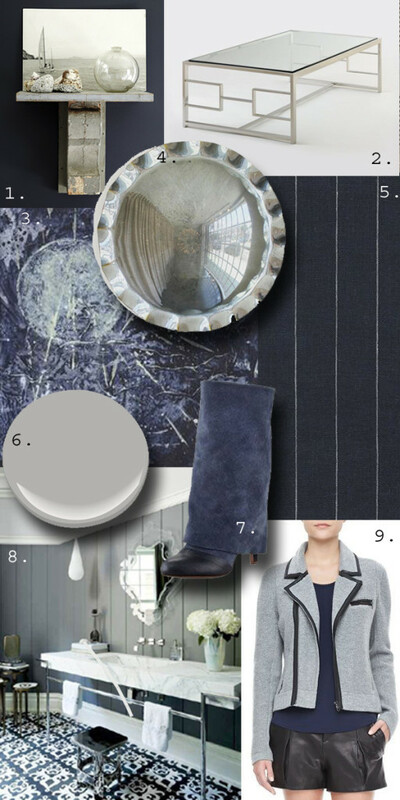 Two colors that I associate with this season are navy and gray. They make a great combination and are so satisfying during short, chilly days! A naturally reflective and bright color, white accommodates a range of accent hues and pairs so well with natural tones. 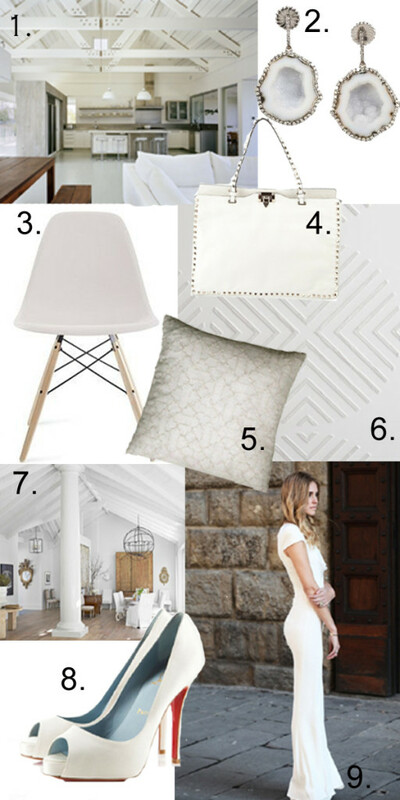 White is a great color in both design and fashion. It is so clean, crisp, and refreshing. A naturally reflective and bright color, white accommodates a range of accent hues and pairs so well with natural tones. During the warm summer months, white looks cool against sun-kissed skin whether worn all over or just with accessories. How do you like to use white? 1. Modern barn design in white by Robert Young Architects. Lately I have been obsessed with the way these three colors look together: tangerine, white, and chocolate. Lately I have been obsessed with the way these three colors look together: tangerine, white, and chocolate. This combination is very strong and can be so graphic. You have to be confident when using a color like tangerine; whether it’s an accent or covers the entire ceiling, you’ve got to be comfortable with it. 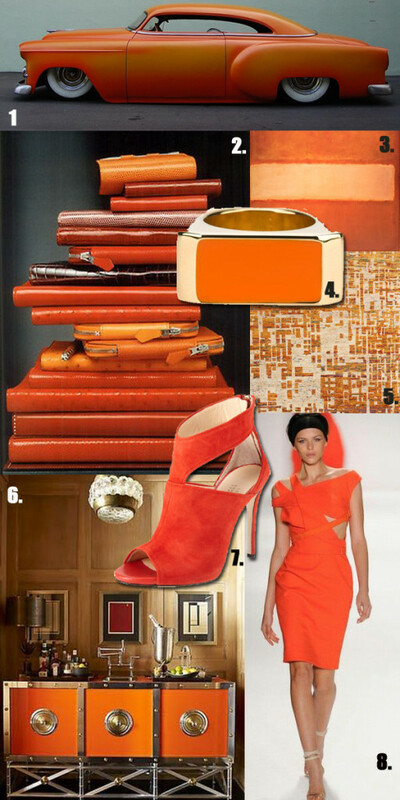 When combining two dominant colors like tangerine and chocolate, you need to think about how to tie them together. White accomplishes this nicely. 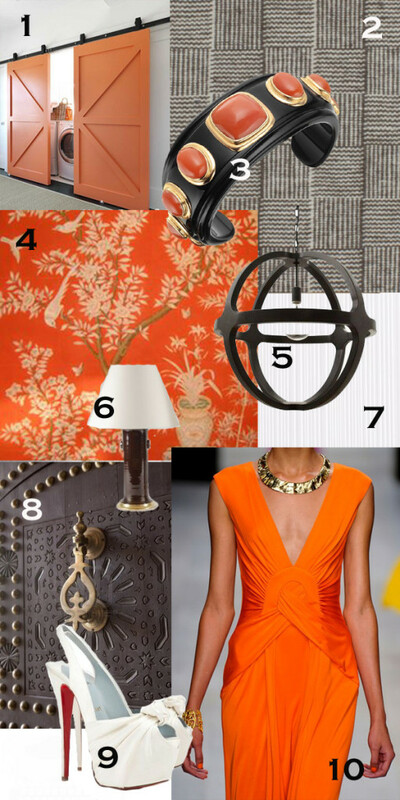 People tend to associate these dark colors with fall, but combined in this way, they can be used all year. 1. Love the color combination and use of barn doors. Via House Beautiful. 6. Ceramic Lamps from Christopher Spitzmiller, Inc. This color combination is classic, sophisticated, and always stylish. One of the things I love about being a designer is the opportunity to find inspiration anywhere. 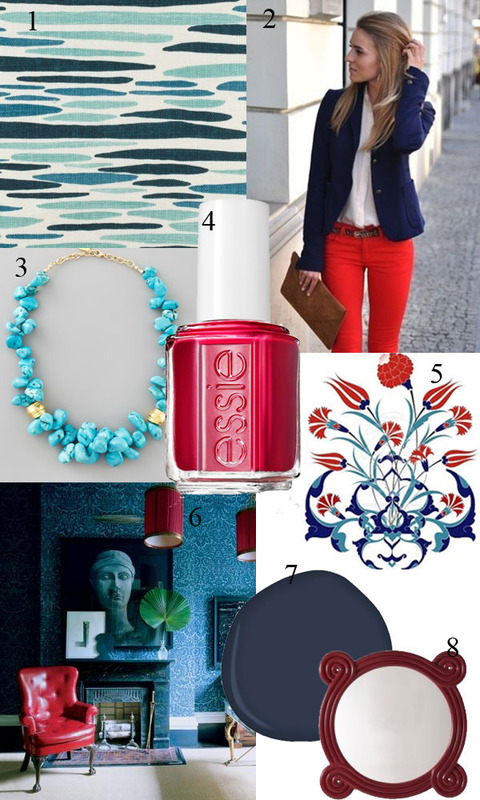 The other day, I was dressed in navy, vermillion, and turquoise and was struck by how great those colors look together. This color combination is classic, sophisticated, and always stylish. In design, these three colors together look bold, confident, and eclectic. 4. She’s Pampered from Essie: My go-to summer nail color! Cover image features, from left to right, Salutation III by Eric Zinner, Giorgio Armani for Elle Decor, and Abstract 116 by Kris Carlson. Celadon is a great color for spring! 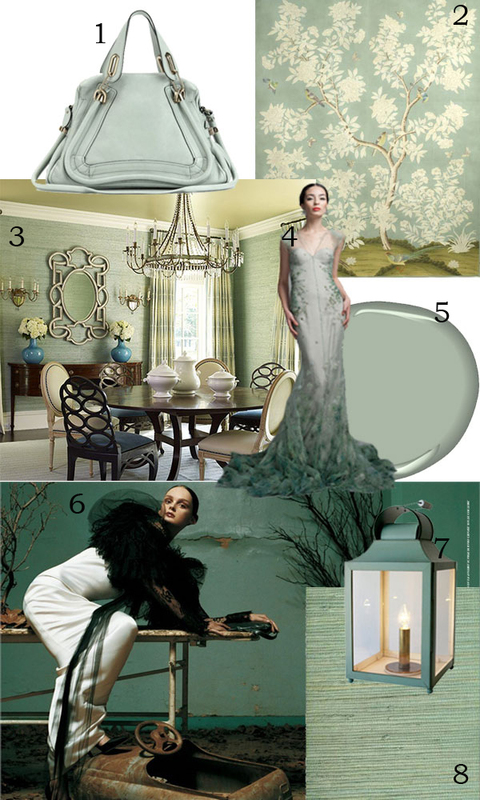 Celadon is a great color for spring! It’s fresh, pretty, and pairs well with a variety colors. With blue and grey, celadon looks sophisticated and soothing. When paired with more vibrant hues, it balances out energetic colors for a well-rounded look. Celadon works with so many other colors because it stems from ocean blues, hazy greys, and muted greens. It definitely has a real zen-like quality! 6. Chic celadon. Image via Vogue. 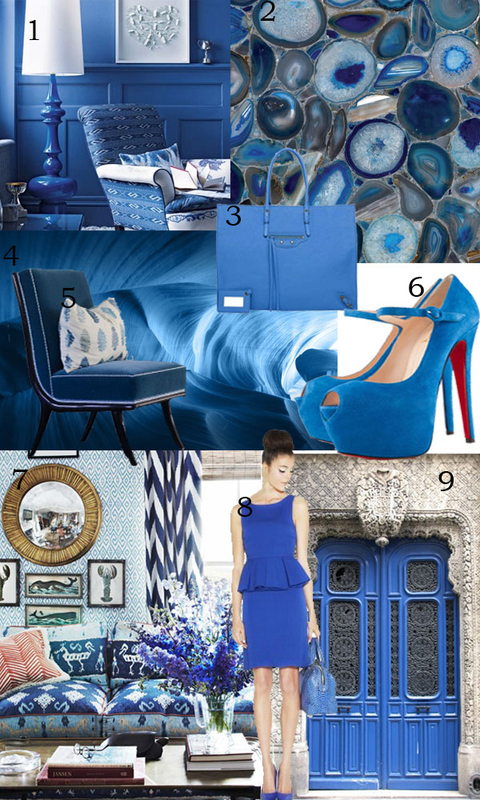 With so many different shades of blue, it can be bright, serene, bold, subtle, or dramatic. Blue is a safe color that a lot of people gravitate toward. With so many different shades of blue, it can be bright, serene, bold, subtle, or dramatic. You can drench a room in blue or use it as a strong accent color. In fashion, blue looks good on almost anyone and pairs well with a lot of other hues. What do you think of blue? 5. Custom chair in a client’s home. Pink is not an easy color to design with, but I can appreciate it in certain elements. I’ll be honest with you — I’m not obsessed with the color pink. It’s just not my go-to color on the wheel. It always seems like such a stereotypical, over-used “girl color” to me, but it also makes me think of bubblegum and Pepto-Bismol. It’s not an easy color to design with, but I can appreciate it in certain elements. I love pink flowers and reading Pinkalicious with my very girly-girl four year old. Pink has also become a positive symbol for breast cancer research and awareness. Many women look beautiful in pink, which exudes femininity. It makes people think of spring, flowers, hope, and happiness. I don’t know about you, but as we endure yet another snow day here, I could use a reminder of spring! What do you think of pink? I absolutely love black! I wear it just about every day. Something about black makes me think of confidence, so I feel stronger when I’m wearing it. 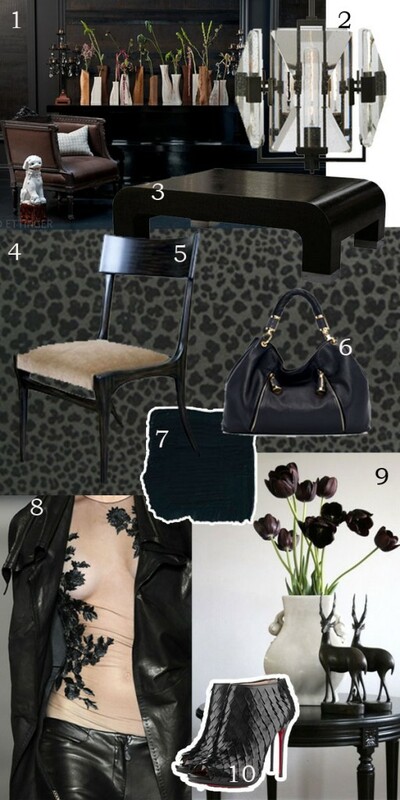 In interior design, black makes a dominant accent color, especially when used in a key area of the room. You can’t be wary of black when designing with it; you have to be bold and fearless, whether you choose to use it for paint, furniture, or fabric. I am obsessed with it! 9. Black tulips: I love these!